Do the Jaguars Need To Go QB Shopping? The Jacksonville Jaguars made it all the way to the AFC Championship last year behind their defense and the brilliant running of Leonard Fournette. This year with the defense not performing so well, and Fournette injured Blake Bortles has needed to play at a higher level. Bortles has not performed well as shown by the Jaguars 3-4 record. 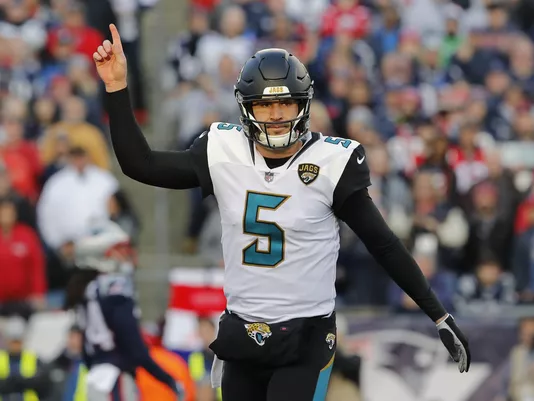 Jaguars who are supposed to be a top team in the AFC have many options to replace Blake Bortles. Here are some options that are readily available to the Jaguars or easy trades to make. Cody Kessler- ​​The Jaguars backup quarterback would not be a bad option to start at. In 2016 as the Browns quarterback in nine games he had a 65.6 completion percentage and a 92.3 quarterback rating (pro-football-reference.com). That would be major step up from Blake Bortles 2018 stats of 60.6 completion percentage and 46.1 quarterback rating. Colin Kaepernick-​​ We all know that if the Jaguars where to sign Kaepernick they would get major attention they may not want, but if it means winning why not? Colin Kaepernick led the San Francisco 49ers to the Superbowl in 2012. Yes, the 49ers had some very bad years after that, but before his release at the end of the 2016 season he did not play a season in which he had under a 75.0 Quarterback rating. Ryan Fitzpatrick- ​​When Jameis Winston was suspended at the beginning of this year “Fitzmagic” lit up opponent defenses. He threw 11 touchdowns and 5 interceptions in 4 games. He has a Quarterback rating of 77.1 and completion percentage of 67.1. An easy trade the Jaguars could make was trade a 3rd or 4th round draft pick for Fitzpatrick. very valuable quarterback to Jacksonville who would not have to give up much in a trade. Nick Foles-​​ Yes, the Super bowl MVP last year is now the Eagles backup quarterback. In 2013 Foles surprised the World with an 8-2 record leading the Eagles to a playoff push in the NFC East. Last year, while Carson Wentz was injured, Foles led the “underdog” Eagles through to playoffs and to a shocking Super Bowl victory over the New England Patriots. The Jaguars might have to give more up such as a 2nd round pick and a young player, but it could be worth their while if they make the Superbowl this year. If the Jaguars wish to be successful especially against the AFC juggernauts of the Kansas City Chiefs and New England Patriots they will need to address this issue within the organization.